As predicted, the UK new car market fell in March, down -15.7%, but still the fourth biggest March ever for the sector. 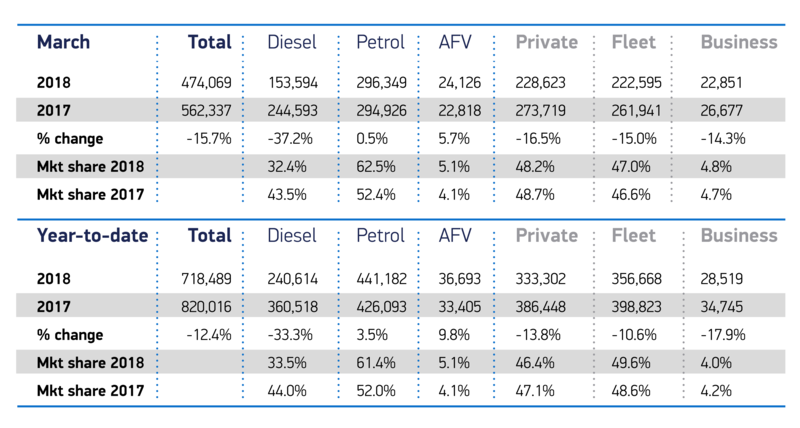 Fall in diesel demand continues, down -37.2% compared to same month last year, with AFVs up 5.7% and petrol holding steady at 0.5%. Overall, first quarter down -12.4%, but over 700,000 motorists drive home in a new car this year. The UK new car market declined in March, according to figures released today by the Society of Motor Manufacturers and Traders (SMMT), with registrations falling -15.7% compared with the same month last year. March 2017 was the biggest month ever for new car registrations, as buyers seized the chance to purchase cars before new Vehicle Excise Duty (VED) rates came into force in April last year. 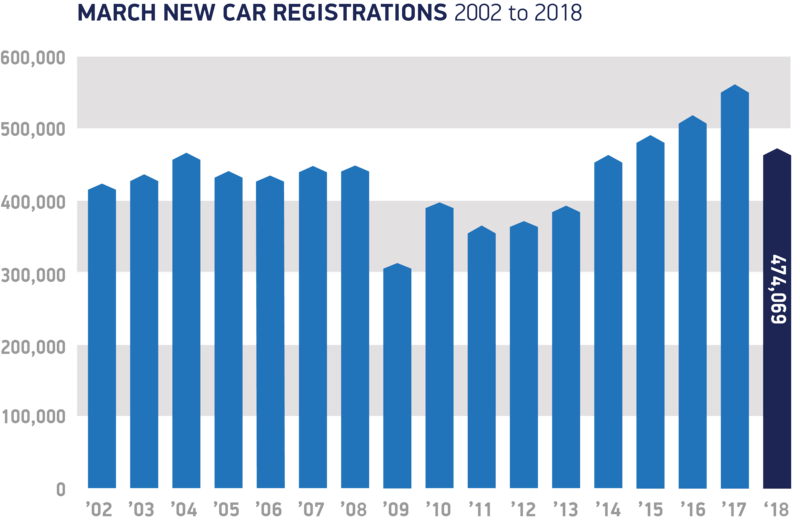 However registrations are still running at a historically high level and last month’s market was the fourth biggest March on record. Economic and political uncertainty and confusion over air quality plans continued to affect confidence, resulting in declines across all sales types. Demand from business, fleet and private buyers all fell in March, down -14.3%, -15.0% and -16.5% respectively. Continuing the recent trend, diesel registrations declined in March, down -37.2%. Registrations of plug-in and hybrid vehicles continued to rise, albeit modestly, up 5.7%, with demand for plug-in hybrids driving growth, up 18.2% for the month. Registrations of petrol cars were essentially stable, up 0.5%. The decline in demand for diesel cars continues to be of concern and the latest tax changes announced by the government do nothing to encourage consumers to exchange their older diesel vehicles for new lower emission models. In terms of vehicle types, demand for dual purpose cars remains the best performer in March, down -0.7%, with just 713 fewer vehicles registered than in the record March 2017. In the first quarter of this year 146,614 of these vehicles hit British roads, an increase of 2.7%, as the inclement weather appeared to lead to a boost in registrations. New car registrations have fallen for the 12th consecutive month, with year-to-date performance down -12.4%. However, nearly 720,000 new high-tech, low-emission cars left forecourts in the first quarter of 2018 as consumers took advantage of competitive offers, meaning last month’s market was still the fourth biggest on record. The UK new car market is a vital part of the UK economy and is often seen as a barometer of consumer and business confidence. A new SMMT study of economic figures highlights the broader industry’s impact on adjacent sectors from logistics, retail and distribution to car finance, fuel, maintenance and insurance. Some 200,000 people are employed in new car retail alone, while UK-based car finance firms employ over 45,000 more, with an annual £12.5 billion economic contribution. On the road, the vehicle fuel industry supports 40,000 jobs, and a further 347,000 are employed in vehicle servicing and repair. March’s decline is not unexpected given the huge surge in registrations in the same month last year. Despite this, the market itself is relatively high with the underlying factors in terms of consumer choice, finance availability and cost of ownership all highly competitive. Consumer and business confidence, however, has taken a knock in recent months and a thriving new car market is essential to the overall health of our economy. This means creating the right economic conditions for all types of consumers to have the confidence to buy new vehicles. All technologies, regardless of fuel type, have a role to play in helping improve air quality whilst meeting our climate change targets, so government must do more to encourage consumers to buy new vehicles rather than hang onto their older, more polluting vehicles.